My name is Bill Beardall and I am an Assistant Director of Facilities Operations at NC State University. My areas of responsibilities are Grounds Management, Fleet Services and Waste Reduction and Recycling. I am writing in regard to an article written by Virginia A. Smith, published in our local newspaper, The Raleigh News and Observer, on the 28th of April  It was a review of your book ‘DEFIANT GARDENS’ Making Gardens in Wartime. The subject matter caught my attention and was well reviewed by Ms. Smith. 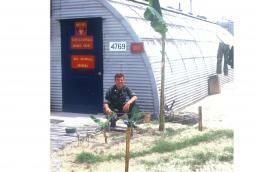 It also caught my attention because I planted a garden while in Vietnam in 1970. It had a calming affect on me to come back to my ‘hootch’ where, as a Marine Helicopter Pilot, after a long day of flying missions in the I Corps area to see a little bit of green growing by my doorway. What you see in the first attachment is early in my garden’s life. The bananas grew much taller, the periwinkles as well. The watermelon actually produced fruit, although by the time they were beginning to show any size, the Marines pulled out of Vietnam. The bananas were a reminder of home, I am a Latino, born and raised in the Republic of Panama and spent my childhood growing up in the rain forests. 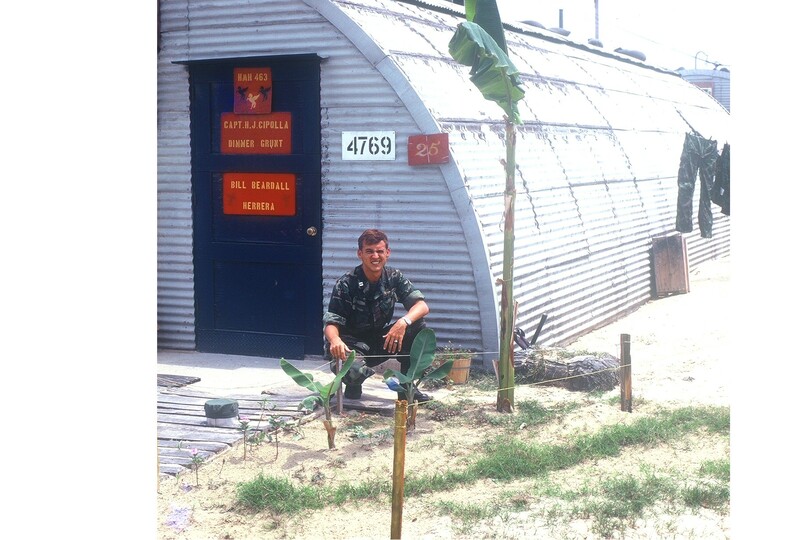 I acquired the bananas while flying resupply missions for the Korean Marines, south of my base at Marble Mountain Air Facility, Vietnam. I casually expressed an interest in the bananas they had near their staging LZ’s. The men knew me by my call sign and by the fact that when they needed it I went above and beyond for them. Days later as I finished a day’s work for them I returned to their site and they had prepared 3 lovely banana trees in pots for me. I was thrilled, I was able to gather up some soil to supplement the sand around the my hootch. Persistent watering kept them flourishing, much to the amusement of my squadron mates and the Vietnamese workers in our area. The Portulaca, periwinkle (seeds from ‘the world’ (the US) were for color, easy to grow, and satisfied my artistic need for a change from the olive drab of our flight suits and aircraft. The watermelon was simply a challenge and a wish for the wet lushness of the fruit. As small as it was, it was my oasis. Many a day or late evening I would sit on my ‘patio’ drink a ‘cocktail’ and enjoy the setting of the sun in the West. I could almost block out the medevac choppers going out and the sound of the artillery in the distance. I have never forgotten much from that war and never my oasis. I thought I would add one more story to your list. I am adding your book to my must read list. Thank you for reminding me that even one small little garden can create a sense of peace and hope in the midst of a war and a warriors heart.